All of us know these names and the work associated with them. But what if these great thinkers (among others) hadn’t documented their ideas? What would we know of them? Especially considering that the extent of their influence came long after they were dead and gone. These ideators were not isolated. Certainly there were plenty of other contemporary great minds with ideas just as groundbreaking. The difference is that the ones we know about documented their ideas in a form that could be shared. They did this during times when it was much harder to document and share ideas than it is today. It took years (hundreds for some) for their work to circulate and gain recognition. We live in a time of unprecedented access to information and ideas. The communication platforms we use everyday give us opportunities the great minds of history never had access to. Yet they took painstaking time and extreme care to document and share their ideas. And that has made all the difference. Are you being intentional about sharing your ideas with the world? Nothing is stopping you. P.S. 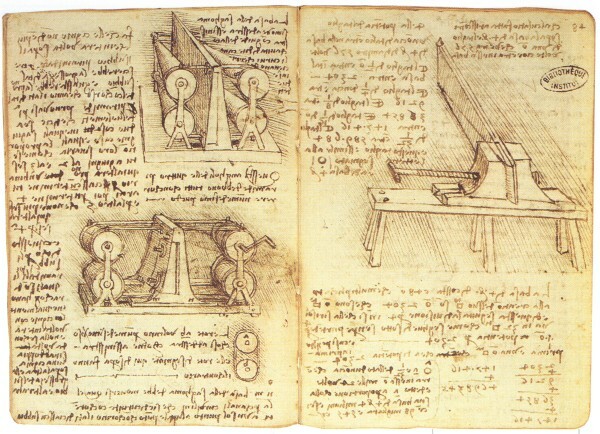 If Da Vinci were alive today, do you think he would tweet? Before you kidnap me and bust my kneecaps, let me say that I think Seth Godin is one of the preeminent marketing minds of our time. If you haven’t read him, click away right now and go read his blog. In fact, read it every day. Here’s what Seth does: He has a blog, writes books, and speaks to very select audiences. Here’s what Seth doesn’t do: Everything else. Seth Godin doesn’t tweet, he doesn’t use Facebook, he doesn’t try to make viral YouTube videos. Basically, he doesn’t do anything that marketing experts say you must do in the current social media landscape to be relevant. According to the social media barometer, Seth Godin is irrelevant. Yet, he is still widely considered one of the leading marketing experts of our time. But how can a leading marketing expert openly refrain from the use of tools that are absolutely changing the way the world finds and shares information? Seth is very open about why he doesn’t use social media. He wants to write the best marketing blog in the world and he considers everything else noise. But people are finding information differently now. They are finding new ideas in the noise. My concern for Seth is that by refusing to embrace these new channels of communication, he’s missing opportunities to reach new people. Sure, those who know about Seth will probably always read his blog and buy his books. I guess what I’m saying is that it would be refreshing for Seth’s voice to be part of the social media conversation (his real voice, not the clunky blog feed from @sethsaid on Twitter). Seth’s ideas continue to be timeless. His delivery may be losing ground. 1. What are my strengths? Build on those, rather than wasting time trying to improve in areas where you have little competence. 2. How do I work best? Alone or with others? Making decisions or advising others? Under pressure or in predictable routines? 3. What are my values? How do your ethics resonate with those of your company? 4. Where do I belong? Based on your strengths, work style, and values, what kind of organization is the best fit for you — where you’ll be able to excel? It’s good to know who your competition is and it’s good to know what they’re doing. It should stop there. Don’t waste a minute being fearful about what they might do that might affect your organization. If you have hours to waste worrying about your competition, you’ll never be innovative enough to beat them. The only thing you can affect is yourself. And the only thing you should fear is paralyzing your progress by worrying about the competition. Focus on doing something unexpected, innovative and simple. Then, let your competition worry about how they’re going to catch up to you. This HBR article is a must read for anyone in the creative industry (or any industry for that matter). It is so good! It’s insight from Dr. Ed Catmull, President of Pixar and Disney Animation Studios. The leaders sort through a mass of ideas to find the ones that fit into a coherent whole—that support the story—which is a very difficult task. It’s like an archaeological dig where you don’t know what you’re looking for or whether you will even find anything. The process is downright scary. We as executives have to resist our natural tendency to avoid or minimize risks, which, of course, is much easier said than done. In the movie business and plenty of others, this instinct leads executives to choose to copy successes rather than try to create something brand-new. That’s why you see so many movies that are so much alike. It also explains why a lot of films aren’t very good. If you want to be original, you have to accept the uncertainty, even when it’s uncomfortable, and have the capability to recover when your organization takes a big risk and fails. What’s the key to being able to recover? Talented people!